I have four children. The eldest turns eleven this year, the youngest is five. 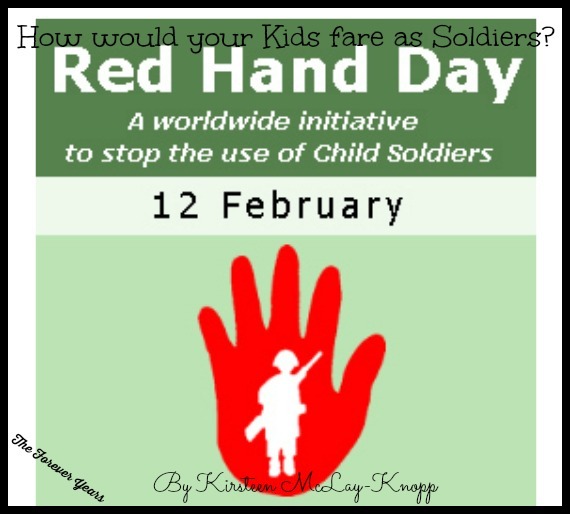 February 12th is “Red Hand Day”, an internationally recognised day for raising awareness of the plight of “Child soldiers” (anyone under the age of 18 who, for what ever reason, bears arms and fights in a conflict). On the eve of that day, I think about my own children… each has their own, distinct personality, goals, hopes and aspirations. They all love to play. We work hard every day to enable them to attend school, participate in sports and other activities and to try to equip them with skills for their future lives, as so many parents do, all around the world. As parents in “peaceful” countries, we are busy with day to day life and the tasks involved in raising our kids. Many prefer not to think about the plights of “other people’s children” in “other countries”, one of the worst of which is that of children made to fight adults’ wars. Some believe problems such as this are just “too big”, so why even bother thinking about them? 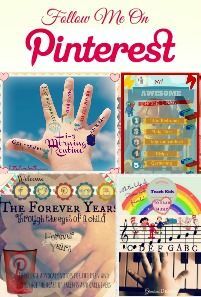 Here at “The Forever Years”, we see the world as a “global family” and believe that this is an important way to think if we are to advocate for the rights of all children everywhere and encourage those who love and care for them. All people are connected and TV images are not so removed from us as we think. If we imagine the fate of child soldiers as being that of our own children, we recoil in horror: the low life expectancy, lack of education or play opportunity, the effects of seeing siblings and friends killed, the fact that child soldiers have a high chance of being physically or sexually abused, as well as all the post traumatic shock effects we see in adult soldiers, are soul destroying, to say the least. You wouldn’t let this happen to your kids– in fact, it’s the very opposite of the protection all our children everywhere deserve. 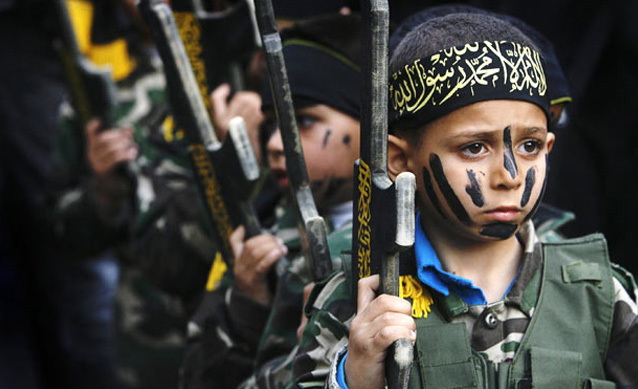 Child soldiers are any children under the age of 18 who are recruited by a state or non-state armed group and used as fighters, cooks, suicide bombers, human shields, messengers, spies, or for sexual purposes. 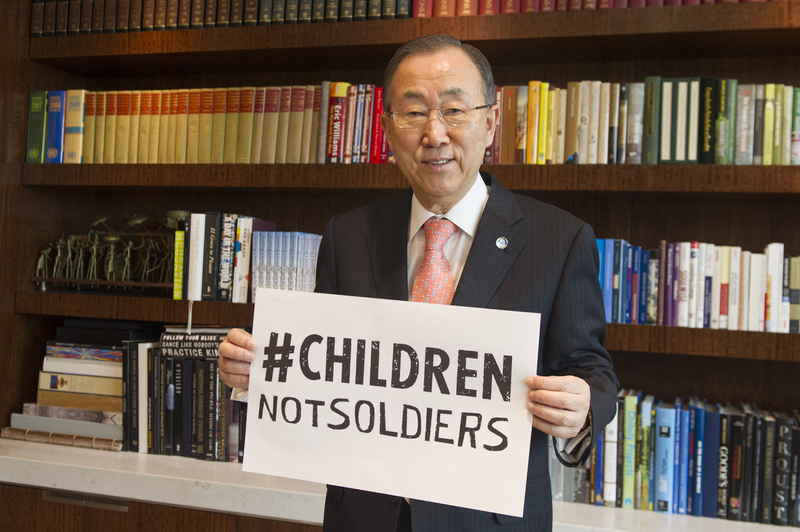 In the last 15 years, the use of child soldiers has spread to almost every region of the world and every armed conflict. Though an exact number is impossible to define, thousands of child soldiers are illegally serving in armed conflict around the world. Children who are poor, displaced from their families, have limited access to education, or live in a combat zone are more likely to be forcibly recruited. 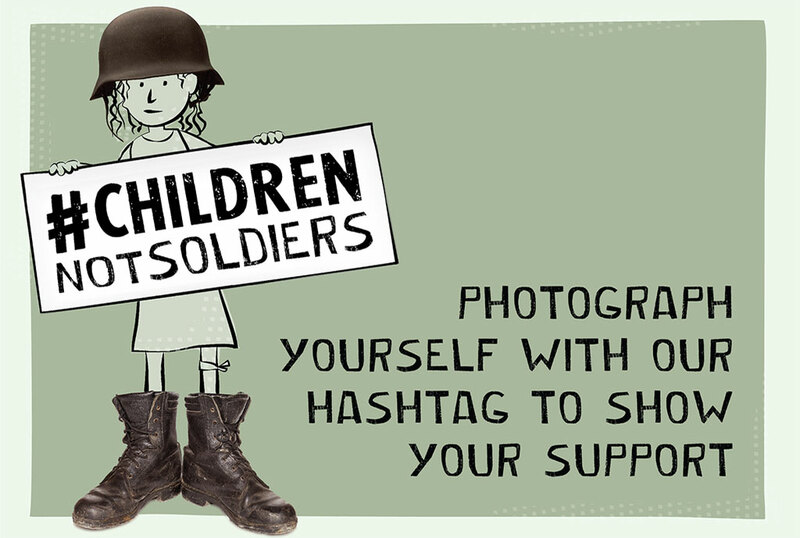 Children who are not forced to be soldiers volunteer themselves, because they feel societal pressure and are under the impression that volunteering will provide a form of income, food, or security, and willingly join the group. 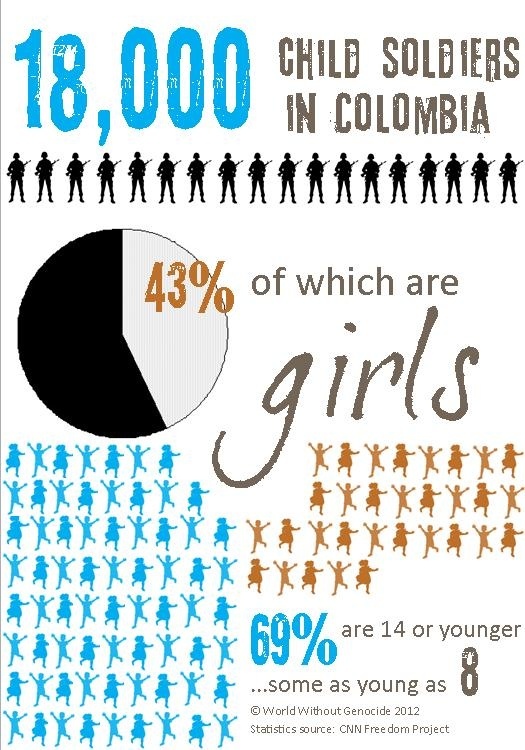 Girls make up an estimated 10 to 30 percent of child soldiers used for fighting and other purposes. 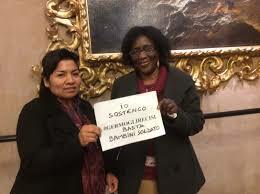 They are especially vulnerable when it comes to sexual violence. 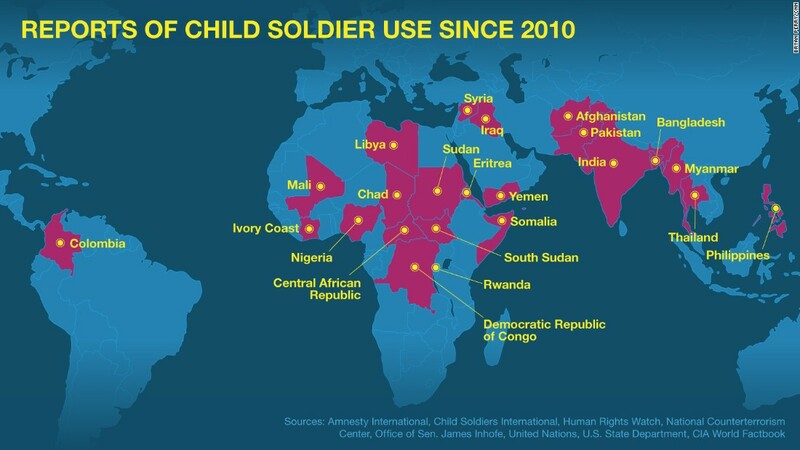 A few of the countries who have reported use of child soldiers in recent years are Afghanistan, Burma/ Myanmar, Central African Republic, Chad, Colombia, Democratic Republic of Congo, India, Iraq, Israel, Libya, Mali, Pakistan, The Philippines, Somalia, South Sudan, Sudan, Syria, Thailand, Uganda and Yemen. 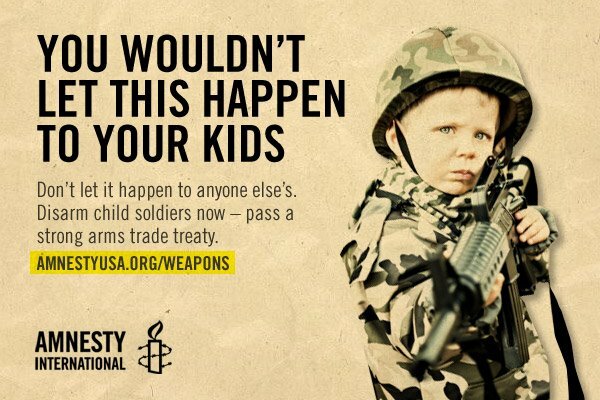 The recruitment of child soldiers breaks several human rights laws. The “Kony Video” in 2012, although unsuccessful in leading to the capture of Joseph Kony, leader of the Lord’s Resistance Army (LRA), in Uganda, was still a victory for child advocacy in that it drew attention to the dire state of affairs with regards to child soldiers around the planet and also drove Kony and his followers into hiding, thus ending his recruitment of child soldiers. The “Kony Video” is powerful, because it shows that individuals can focus on a particular area of concern and affect change. 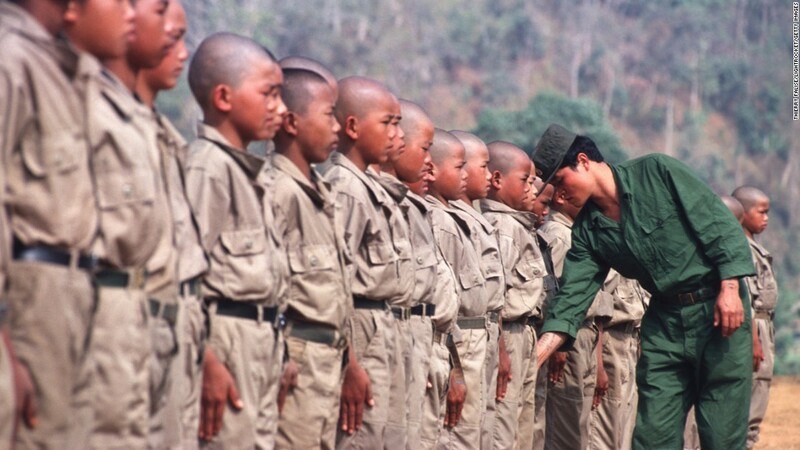 There are a number of online movements and petitions where ordinary people can express their concern at the plight of child soldiers… see the above link above https://www.dosomething.org/. 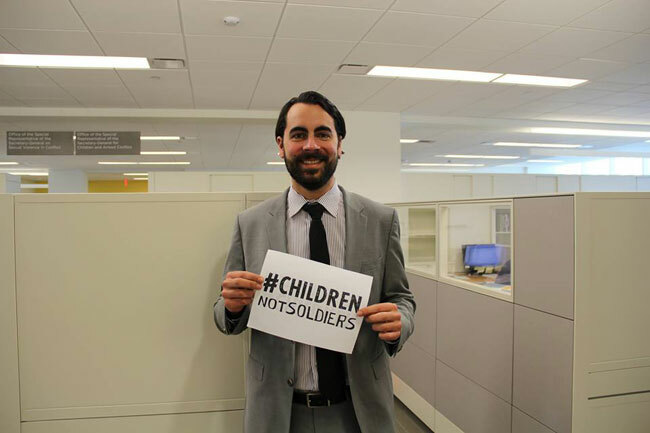 UNlCEF’s #childrennotsoldiers campaign provided another such way of expressing support (see pictures below). 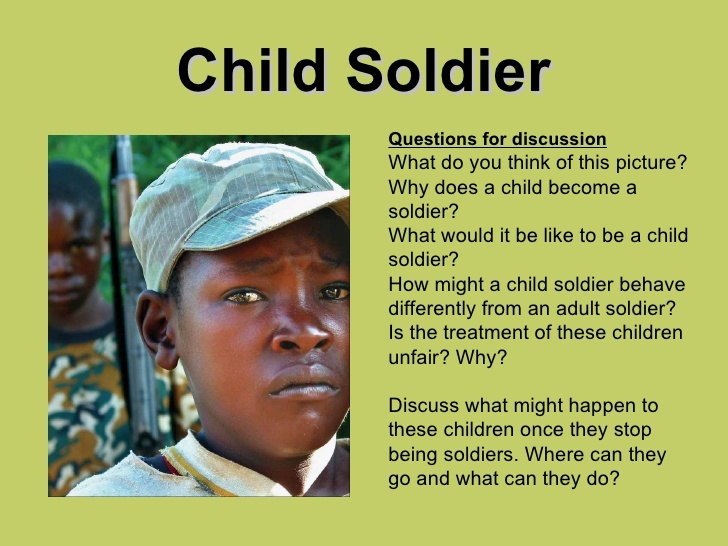 The resource below could be useful when discussing the issue of child soldiers with kids. 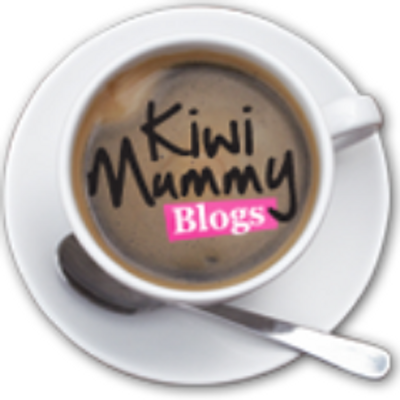 Of course “Red Hand Day” provides another opportunity to promote awareness around the globe. 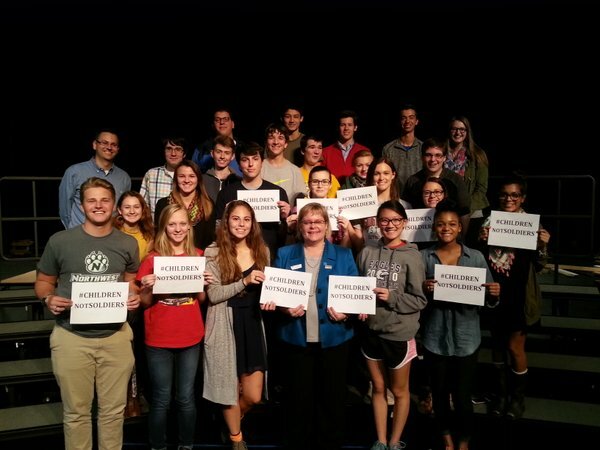 These kids deserve better… they are “our” children too.